Chair, IRA Children’s Book Award Committee. at the 34th Chicago International Television Festival. BAFTA Award – GOODNIGHT MISTER THAW? 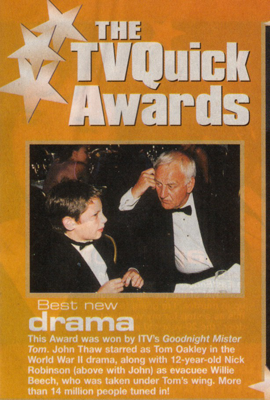 It’s official; John Thaw was voted the people’s choice after picking up the Lew Grade audience award for most popular programme, voted for by RT readers. 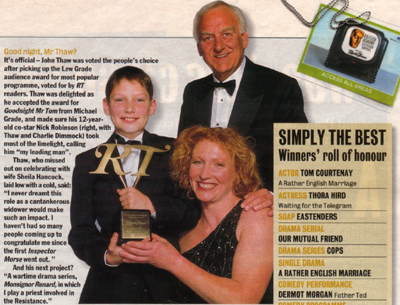 Thaw was delighted as he accepted the award for Goodnight Mister Tom from Michael Grade, and made sure his 12-year-old co-star Nick Robinson (right, with Thaw and Charlie Dimmock), took most of the limelight, calling him, ” my leading man”.